Beginning her career in silent films playing everything from maids to exotic slave girls and a variety of Asian vamps, by the mid-1930s Myrna Loy had worked her way up the Hollywood ladder to become one of the silver screen's favorite "perfect wife" comediennes and was even crowned Queen of Hollywood opposite King Clark Gable in 1936 after the two won a newspaper popularity poll. She was never nominated for any Oscars but remained one of the movies' most popular leading ladies through the 1940s, and in 1990 the Academy of Motion Picture Arts and Sciences presented her with an honorary award for career achievement. Loy had already appeared in more than sixty films by the time she was cast as Ursula Georgie, the half-Asian-Indian secretary to a swami who uses her position and a series of bad horoscopes to exact revenge on a group of schoolmates who were mean to her as a child. Starring Irene Dunne as the loving mother who watches her old classmates die mysteriously one by one, and whose son is threatened in Loy's ultimate act of villainy, THIRTEEN WOMEN (1933) seems like a very silly thriller more than seven decades after its debut. However, the film remains interesting not only for its portrayal of the upper-middle class obsession with astrology and horoscopes in the 1920s and '30s, but also the kinds of exotic, usually Oriental and frequently evil seductresses and femmes fatales Loy played in many-a movie melodrama up until her break-out into more mainstream Caucasian roles in the mid-1930s. Beginning with a supporting role in RKO's adaptation of the popular Phillip Barry stage comedy THE ANIMAL KINGDOM (1932), Loy began to gain attention for her comedic talents. 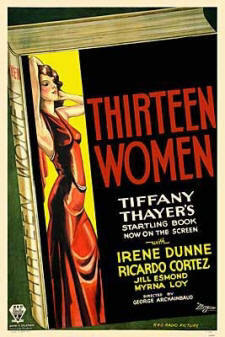 But it was her role in a crime drama under her new contract with MGM in 1934 that made her a star. 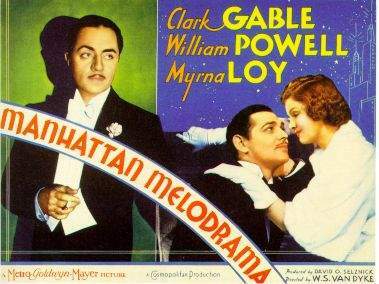 Co-starring Clark Gable and William Powell, MANHATTAN MELODRAMA (1934) told the story of a woman torn between two childhood friends on opposite sides of the law, and though pretty typical depression-era film fare, the movie ended up being a box office sensation when it was reported that the notorious bank robber John Dillinger had just seen MANHATTAN MELODRAMA when he was gunned down by Chicago law enforcement authorities in front of the city's now-legendary Biograph Theater on July 22, 1934. 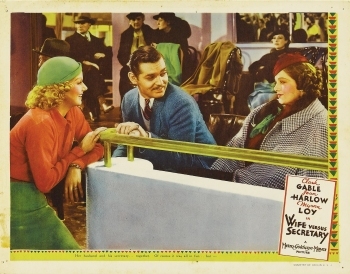 In WIFE VS. SECRETARY (1936), the fourth of her seven talkies with Clark Gable, Loy plays a loving wife who lets everyone else's suspicions about her husband's pretty secretary (Jean Harlow) get to her. What starts off as a pleasantly playful romantic comedy grows gradually more serious as the rumors of a love triangle begin to take their toll on the marriage, and Loy's performance bridges the transition flawlessly, making for one of her most complex performances to date. 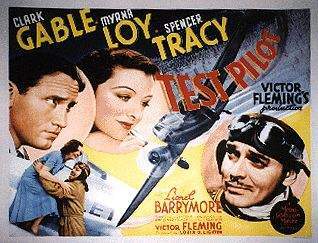 In yet another romantic drama with Gable, this time co-starring Spencer Tracy, Loy plays a Kansas farm girl torn between her love for a flier and her fear of losing him in Victor Fleming's TEST PILOT (1938). 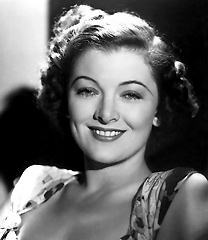 Featuring stand-out performances by the entire cast, and highlighting Loy's ability to play both flirtatious and tough, making her every American male's ideal "gal pal", TEST PILOT earned three Academy Awards nominations, including one for Best Picture. 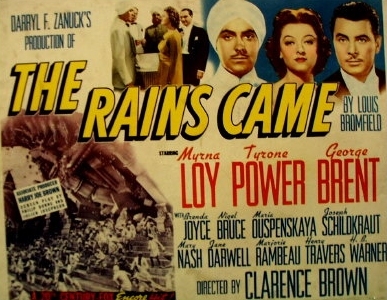 On loan out to 20th Century-Fox, Loy received top billing over both Tyrone Power and George Brent in the studio's 1939 film adaptation of Louis Bromfield's novel about the modernization of India, THE RAINS CAME. Though honored with six creative Academy Award nominations, including those for cinematography (Arthur Miller), art direction and original score (Alfred Newman), as well as the Best Special Effects Oscar, THE RAINS CAME develops from a humorous cultural snapshot filled with slyly intriguing characters into a third world romantic melodrama that ultimately disappoints. Nevertheless, thanks in part to Arthur Miller's lighting and the more structured fashions of the late 1930s, Loy is gorgeous in this film, and THE RAINS CAME provides her with an interesting opportunity to bring a little of her wry wit and spirit to a totally different cultural setting without seeming out of place.